Push back recliner chairs are still a relatively new style, even though they have been around for several years. The sleek style that these chairs are known for works great in contemporary homes. Since you don’t need to have a lot of space between them, push back recliners are also commonly found grouped around home entertainment systems. Instead of pulling a tab or lever you simply lean back in the chair to recline, and sit forward when you want the chair in the upright position. 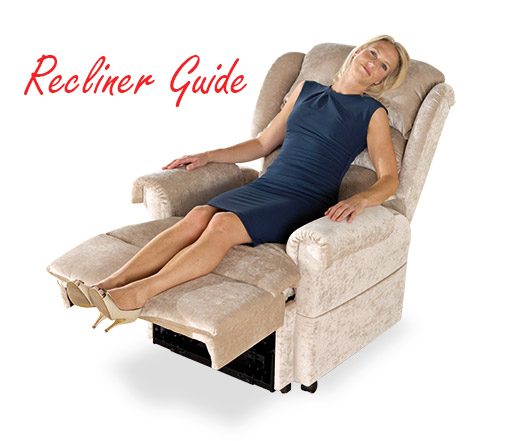 If you are interested in finding a push back recliner chair and don’t know what to look for, this buying guide will help you get started. One of the first aspects to consider is your budget, according to the best push back recliner reviews. These chairs are already priced higher than traditional two position models so deciding on a budget can help prevent you from spending more than you can comfortably afford. Some factors that will affect the price of the push back recliner chairs include upholstery, construction and any included features. Once you have a spending limit deciding on the rest will be relatively easy. Even though push back recliner chairs do have a sleeker style, thanks to the lack of a lever or pull tab, there are still a few factors to consider. The color of the recliner will vary depending on the type of fabric used to upholster the chair, and some can even come in interesting prints. The actual size of the recliner can also vary, from large overstuffed models to smaller wall huggers. 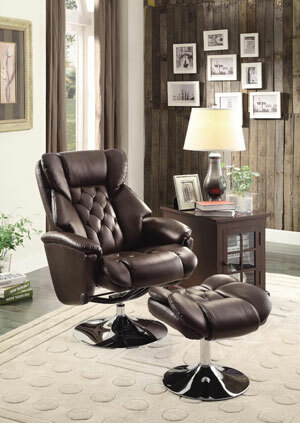 Taking a few minutes to look over the room will help you find the best push back recliner chair for your space. There are several types of fabrics to choose from, and each has its own advantages and disadvantages. Where and how the recliner is going to be used, along with your budget will help you narrow down your possible choices. While leather upholstery is durable, fire resistant, and comfortable, it is also priced higher than other materials. 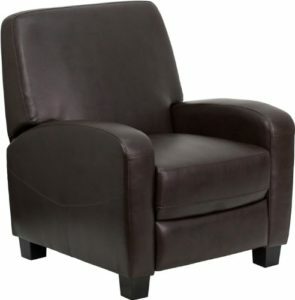 It can give a push back recliner a more contemporary look, and is a great choice for a den or office. 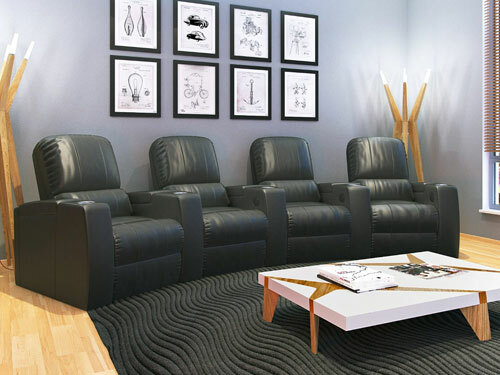 You probably don’t want to choose leather if the push back recliner is for a home entertainment center since the material is difficult to keep clean and spills can be common when you are watching a movie. 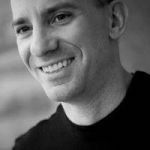 It is also important to pay attention to the look and feel of leather since the quality can vary. Often less expensive than other types of upholstery and available in prints and a variety of colors, cotton and microfiber materials are quickly becoming a popular choice with consumers. The fabric is durable, resistant to stains, and easy to maintain. The texture can also vary, which gives you even more possible choices. Cotton and microfiber is flammable and this should be carefully consider when you are deciding where to place the push back recliner. Even though many people feel that polyester upholstery can be uncomfortable, it is still a great choice if you know that there are going to be spills on the chair. Many push back recliners designed for children are upholstered in polyester, and you also have the advantage of being able to choose from different colors and prints. Polyester is also inexpensive and extremely durable. This fabrics are not as common, and you probably don’t want to choose an acrylic or wool push back recliner if you want to place the chair in a sunny spot or live in a warmer climate. Wool can also be difficult to care for, and acrylic will easily show marks and scars. Push back recliners can come with the same great features as traditional models. Some can rock or glide and you can even find models that swivel 360 degrees. Almost all come with an attached footrest for added comfort and support, though you can find models with a matching ottoman. Other features to consider can include massaging functions that make it even easier to relax, and there are also models that come with settings for soothing heat. Cup holders and side pockets are always convenient, and are becoming more common on newer models. If comfort is your biggest concern then you might want to look for a push back recliner chair that comes with extra padding in the head, seat, and back and even in the arms. Before you rush out to purchase a push back recliner chair there are a few factors to consider. One of the main ones is who is going to be using the chair. These chairs require some effort to recline and sit up since there is not a convenient lever or tab to use. If you have back or neck problems reclining and sitting up can be a problem. This is especially important if the recliner is for young children or older adults. Small pets and babies just learning to crawl can also make you reconsider a few of the features. A rocker recliner could pose a potential risk since it is easy for kids and pets to get trapped underneath. 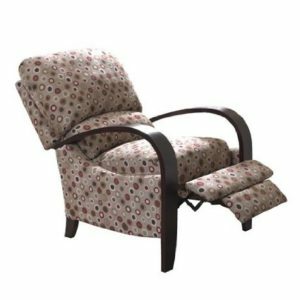 Now that you have a good idea of what you are looking for finding the best push back recliner chair for your home or office should be relatively easy. To help you get started you can find brief reviews on the top push back recliners listed below. Has a uniquotrest comfortably supports your legs and automatically extends when the chair is reclined. The distinctive print can limit where this chair can be placed, and its smaller size might not be comfortable for larger adults. 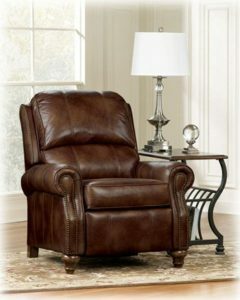 If you are looking for a unique recliner for your home then this model from Madison Park might be perfect for you. The bold print easily catches the eye, and the subdued colors ensure that it doesn’t look out of place. You will love the “retro” design that adds a touch of style to any room, especially the curved armrests. Comfort also isn’t a problem, especially with the thick padding in the seat and chair back. Measuring 29” x 37” x 39” this push back recliner is perfect for smaller spaces, and it also comes at a price that almost anyone can afford. 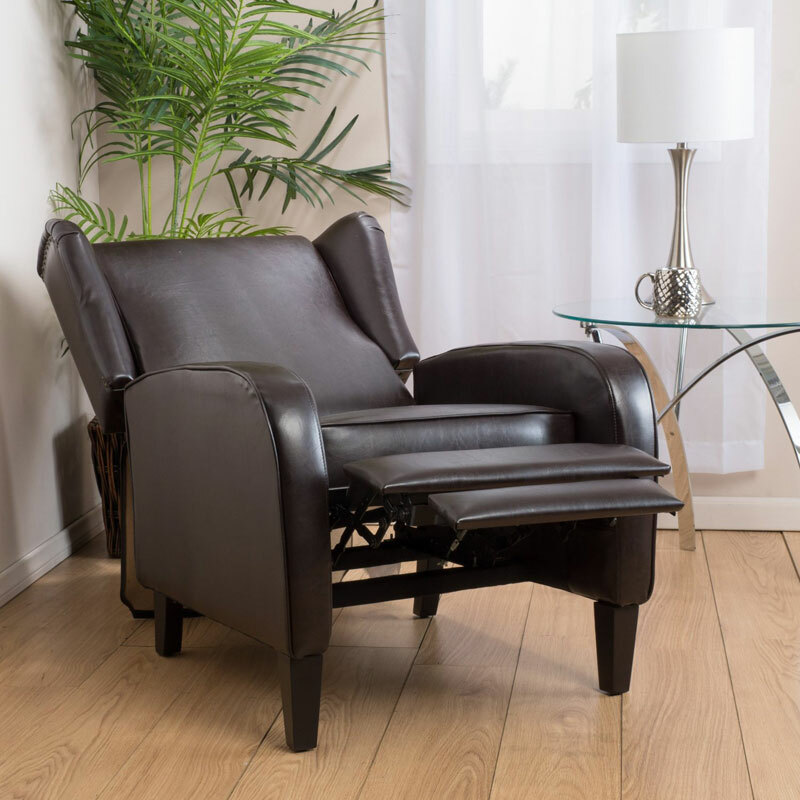 The slightly narrower footrest gives this push back recliner chair a sleek and modern appearance. Its wood legs ensure plenty of stability, along with making this recliner a good value for your money. The thick padded cushion is perfect for relaxing, and the armrests provide additional comfort. You will love how comfortable the microfiber upholstery is, and it is also easy to maintain. While this push back recliner has received mostly positive reviews, some consumers have mentioned that it is too small for their comfort. It is important to check the measurements on any recliner before purchasing since the size can and does vary according to the manufacturer. 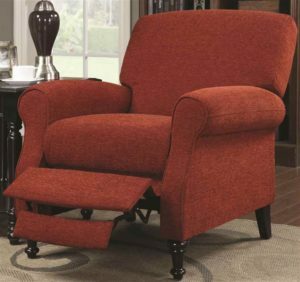 This push back recliner chair by Coaster Home Furnishings is designed for comfort, style and value. The rolled arms give it a more traditional look, while the polished turned legs and narrow footrest ensures that it still has the contemporary design these recliners are known for. It also comes with plenty of cushioning so you can sit comfortably for hours. The dark red microfiber upholstery is easy to care for, and it is also durable so the recliner will look great for years. Even though the footrest is smaller it is still wide enough to give your legs plenty of support, and it is also padded for your comfort. Easy to assemble and designed to last for years, this push back recliner might be just what you are looking for. 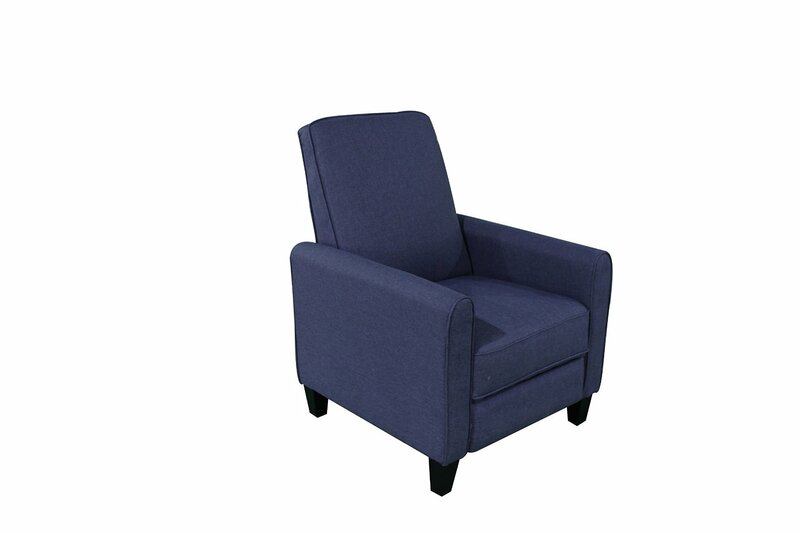 This sleek push back recliner chair is designed to fit perfectly in smaller spaces. The linen upholstery is comfortable to sit on, and designed to be resistant to stains. Its durable frame can withstand years of use without sagging or buckling. You will appreciate the attached footrest that provides additional support. Even though the linen upholstery is stain resistant it can still be difficult to maintain, especially if you have pets or kids. There is very little not to like about this chair. It is designed for style and function, and is a great choice for smaller spaces. The linen upholstery gives it a comfortable feel and elegant appearance, though it can be hard to keep clean. There is plenty of padding throughout the chair so you can stay comfortable for hours, and you will love how easy it is to push it back into the reclining position. The sturdy frame and strong legs ensures that the Savannah will last for years, and that it is a good value for your money. Curl up with a good book, watch TV or take a nap in this push back recliner from NHI. The wood frame won’t easily bend or buckle, and it is also “corner blocked” for additional strength. The bun wood legs, nail head accents and rolled arms give this push back recliner a sleek and stylish appearance. You will appreciate how easy it is to recline and raise back to the upright position. It is upholstered in polyester-polyurethane blended faux leather that is durable and easy to maintain. There are very few negative comments about this push back recliner, except one consumer did mention that the upholstery was scratched on delivery. 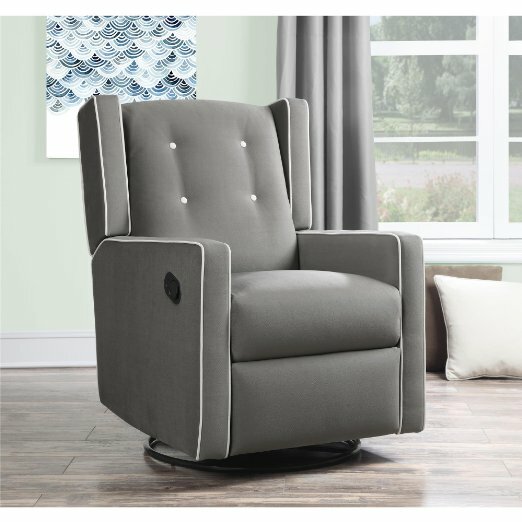 Ashley Furniture has designed a push back recliner chair that is durable, functional, and comfortable and looks great in almost any home. The faux leather upholstery is easy to care for and gives the chair a rustic appearance that is only enhanced with the nail head accents. The push back recliner also comes with plenty of padding to ensure hours of comfort. The chair is easy to recline and the matching footrest automatically extends to provide support for your legs. You will also appreciate its solid frame that ensures years of use. Constructed by one of the leading names in the industry, you know that you are getting a good value for your money with this push back chair from Ashley Furniture. You will love the affordable price that is designed to fit most budgets. Its sleek and comfortable design makes this push back recliner a great choice for home entertainment systems. The leather upholstery is comfortable to sit on and it is also easy to care for. With its sturdy frame and strong legs this push back recliner chair can last for years. Some consumers have noted that this recliner is too small for taller adults, but it should be noted that it is designed to be used more for home entertainment viewing than for napping. Flash Furniture is well known for their affordable recliners, and this push back model is no exception. It is priced to fit almost any budget, while still providing you with the quality you expect from this manufacturer. The leather upholstery is easy to care for, and resistant to most stains. It also comes with a sturdy frame that won’t easily bend or buckle. There is plenty of padding in the seat, back and arm rest so you can comfortably watch movies for hours. Its sleek design also makes it easy to arrange with other push back recliners for seating around your home theater system. Whether you need an accent chair or something to sit back and watch movies in this inexpensive push back recliner chair might be exactly what you are looking for.